There is so much more to photosharing than uploading images from the latest event! Yes, everyone likes to see themselves online, but Flickr is so much more than uploading images from the latest event. Flickr combines the power of visual storytelling with the very nature of a social network - engagement and conversation. Three arts organizations (Houston Ballet, Massachusetts Museum of Contemporary Art and Luce Foundation Center for American Art) are innovating ways to use Flickr creatively, and in the process offering backstage passes to the organization, amplifying programming, and engaging stakeholders in real decision-making. The Houston Ballet uses Flickr to offer a “backstage pass“ to all of its fans. In particular, the ballet company offers its enthusiasts (and all Flickr browsers) visual insights into the organization’s activities and administration. What does this do? It offers Houston Ballet fans added value for subscribing to the Ballet’s photostream. It makes them feel special, too. How often does one get to look into the closet of a major ballet theater, or learn how they put their sets together? The Ballet has made their photostream an unique web destination for exclusive “backstage” information. The Mass Museum of Contemporary Art (MassMOCA) uses Flickr to crowdsource a set of images for the Flickr Finds section of its blog. MassMOCA asks readers to upload photos of a specific topical nature to the MassMOCA Flickr site. They post a roundup of the best photos on their monthly Flickr Finds blog post. The photos usually relate to one of the concurrent exhibits. It’s a great way to create excitement around a current exhibit or an organization. What does this do? It adds another dimension to exhibitions and creates enthusiasm on the Flickr and blogging platforms. It also extends the life of exhibitions and creatively engages fans. Lastly, it offers added publicity for MassMOCA: every photo uploaded to the MassMOCA Flickr group also appears on the photographer’s photostream and is indexed and tagged on Flickr as MassMOCA! The Luce Foundation Center for American Art is “an open study/storage facility displaying about thirty-three hundred objects from the collections of the Smithsonian American Art Museum. Here, our visitors can see works that would otherwise not be on view due to space restraints in our main galleries.” The Luce Foundation Center occupies 20,400 square feet of the Smithsonian’s American Art Museum’s collection. According to the Smithsonian’s blog Eye Level, the Smithsonian American Art Museum lends work out, often for 12 months to other institutions, leaving gaps in the display units. They write: “for this reason, we decided to open up this process and ask our online communities for help. Using Flickr, we can share a photo of a case (in the Luce Foundation Center) that needs a replacement artwork, provide information about all of the other works in the case, and challenge people to search our collections in order to find an appropriate substitution. What a wonderful way to engage stakeholders in the decision-making process and offer them a “backstage pass” to the art collection! Case 34B - Gap Filled! What does this do? It creates an interaction between static works of art and the fans who love the art. It makes everyone a “citizen curator,” and a stakeholder in the outcome of the Fill the Gap replacement selection. It creates enthusiasm and publicity for the collection of art. Most importantly, it utilizes the crowdsourcing aspect of social media to engage fans, create deeper connections between them and the organization, and…select art for exhibition. Think about using Flickr to offer “backstage passes,” crowdsource ideas, extend the life of your programming, or engage stakeholders in real organizational decisions. What are you waiting for? Debra Askanase is a former community organizer and executive director, and the founder and lead consultant at Community Organizer 2.0, a social media strategy firm for non-profit organizations and businesses. What Advice Would You Give to Retina Australia To Avoid Jumping into Social Media err blindly? It's been over a month since my trip to Australia where I presented and facilitated workshops at the ConnectingUp Conference. While the tim-tams are long gone, the fantastic people I connected with are still with me - if only virtually. "Research is at the stage of human trials in stem cell treatment. At this point funding becomes urgent. Our goals are now specific and exciting. 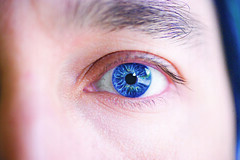 I am secretary of Retina Australia (Qld) and on the board of directors of Retina Australia. Personally, my goal is to see myself out of a job in 5 years. How do I get others involved?" She asked for a starting point, one or two things that she could start on to begin to bring their cause to the attention of more people. She asks, "How can I get people to feel what it’s like to be touched by blindness, or to be a parent and watch your child loose their sight." I pointed her to the WeAreMedia Module 1: Should Your Nonprofit Embrace Social Media or Not? and develop an initial plan - perhaps using the soon to be finished template in Module 2. I, of course, loved the flickr competition idea and suggested that she consider a modest outcome and learning experiment. Here's a few steps. 1. 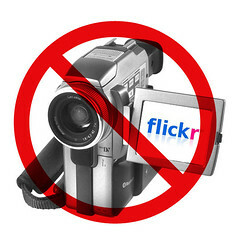 Read the TechSoup article "How Nonprofits Can Get the Most Out of Flickr"
2. Come up with a list of questions of what she needs to know or learn about to design a contest that will be successful. 3. 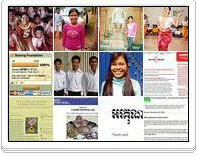 Read up on Flickr and look at different examples by nonprofits. 4. 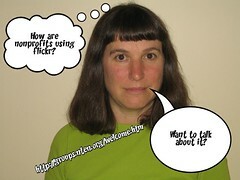 Ask other folks from nonprofits who have used Flickr to run contests. Clear guidelines are important - see this interview I did with folks from Nature Conservancy about their contest. 5. I'm hoping these flickr mavens will leave their best advice in the comments ..
What advice would you offer Retina Australia? Is Video On Flickr A Good Thing? Not in my backyard or way cool reaction? Flickr has announced a new feature - that you can post 90 second videos on flickr. You can check out some of the videos in this group. The FAQ is here. What really fascinating is that there is a "No Video on Flickr Group" that has over 12, 000 members. So, I wondered about the "Not in my Backyard Reaction!" Here's my backyard shot with my camera phone and posted by email. Having video on Flickr feels strange. I'm not sure about. The embed is sort of cool - it will automatically resize the video for you. What do you think? Is video on Flickr a good thing? A few days ago TechSoup and Flickr sponsored an online event discussion about the use of Flickr and photography in non profit organizations. Michaela Hackner participated and had some great insights. She blogged her reflections into one excellent post! Enjoy! More from the TechSoup blog. 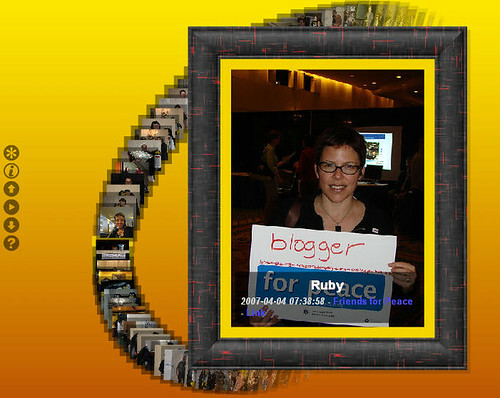 Today, I'm co-hosting an online event on TechSoup about Flickr with Heather Camp, Flickr Community Manager. I love online discussions with a mix of experience. I just learned something really important from colleague Michaela Hackner about uploading. I think there is a benefit of uploading only 4-6 photos at a time because your followers only see the last 4 images you've posted anyway. Sharing a few photos at a time helps you be more thoughtful about captions, tags, and categorizing, and gives people a chance to catch up on your stream. When I was at the height of my Flickr obsession (and living overseas when I had a lot more time), I limited myself to posting no more than 4 images at a time for this reason. This event will run today. Ask questions, share your learning, and learn from others. Click here participate. We will explore how to make the most of Flickr and other photo-sharing and editing webtools for your organization. The event will cover the benefits of creatively displaying your nonprofit organizations' work in images. We will share tips for organizing and managing your photos. In addition, we'll discuss case studies of innovative and creative ways nonprofits are using Flickr to further their missions. Join us Tues. Mar. 25 in the TechSoup Emerging Technologies Forum as we explore these topics and more. Be sure to check out this recent introductory article I wrote over at TechSoup. Last night when I was putting this talk togther, I got a last minute bolt of inspiration from Ethan Zuckerman's talk at E-Tech called the cute cat theory. It's call the cute dog theory. Notes and links on the wiki. I'm prepping a talk for Funders Network Briefing and seeking any examples of Women's Reproductive Health advocacy, organizing, or education using Social Networks (Facebook), Flickr, and Twitter. I got a few leads, but would like some more. Even if you're using those tools as part of a larger campaign, I'd like to see those too. So, drop a line in the comments. True confessions. I am a member of the Flickr Fan Art Group. But you all probably knew I was a fan already. In the article, I describe five nonprofit "starter" use profiles - easy ways to get started. Photo Bank: An international organization sends volunteer doctors to developing countries around the world to perform medical services. The physicians document the impact of their work through photos that they upload to the organization's private Flickr group. Not only does Flickr help the volunteers exchange photos and information, it also creates an image bank from which the organization can select photos for its Web site and blog. Photographic Documentation: An environmental organization that supports organic farmers had literally thousands of amazing photographs documenting the development of organic farming techniques over the last decade. Before using Flickr, no one had organized or categorized the photos, which were scattered on various hard drives in the office and on volunteers' computers. The organization uploaded the photos to Flickr and were able to enlist the help of volunteers and members to document the techniques. Internal Planning: A museum was mounting a special collaborative exhibition with institutions located in five cities around the world. As the group prepared the installation, they used Flickr to share photos with one another, allowing them to see what a "textured plaster" wall finish looked like before approving the contracting work; get a visual reference of the exhibition space when selecting picture frames; and see work completed to date. Flickr provided a way for the collaborators to easily upload and share photos publicly and privately. Presentations: An executive director wanted to use photos to make her points during a presentation, but disliked clip art and lacked the budget for stock photography. Using Flickr's Creative Commons licensing search feature, she was to find appropriate photos that she could use for free with attribution. Make Stuff: Volunteers and talented photographers for an animal shelter had taken beautiful photos of some the dogs and cats at their facility. The organization wanted to create special cards featuring the pets that they could use as thank-you notes. Uploading the photos into Flickr, they were able to order cards and other items. There are, of course, many other nonprofit uses - but I wanted to get at some beginner use profiles. So, if this is Flickr 101, what is Flickr 201? And, if you are not on Flickr. TechSoup just launched a donation program. Read more about it on the Flickr blog. The Nature Conservancy has used Flickr Group to host a photo contest on its Web site. Here's an interview with Nature Conservancy staff members Evan Parker and Susan Citro about how the organization is using Flickr. Why did your decide to set up a group on Flickr? We started the group in the summer of 2006, and have 6,400 members and 64,000 images submitted as of this morning. The group takes in about 80% of the images for our contest, with the rest coming via email. We could have run the photo contest without Flickr, but we were interested in the Flickr community, but also to give our existing members another way to interact with us. We have had really great success on both fronts. What is your best advice on using groups? Keep up with the discussions often, but not too often -- We have someone who looks at the postings everyday, but we try not to jump into the threads unless there is something only we (as the organization) could contribute. Our community really is self-managing. If someone has a question or says something out of line, the community rises up and handles the situation, and usually before have the chance to jump in. We like to wait for the community to self-manage because it keeps our group authentic. Keep them engaged. Our flickr group started around a photo contest which runs about 4 months a year, but we try and feed smaller activities (such as submit a nature photo for mother's day, or submit your favorite marine photo) in the other 8 months of the year to keep the group active. They aren't as robust, certainly, but it keeps our most active group members engaged. What is the work flow to make it successful? We use the discussions area and the group home page announcement space to keep the community up to date on the latest way to engage with the Conservancy. Each time we ask for people to submit photos, we tell them how they are going to be used as part of the announcement. We then only use photos that have the specific tag attached ("BestNature-TNC07" or "MothersDay-TNC07"). This allows us to assume that if they put the tag on their photo, that they have read the announcement well enough to know how it is going to be used. For smaller contests (marine, mother's day) we just review the images through the Flickr site, but the larger contest have enough contributions (15,000 this past year) that we have to use an offline workflow (ie. Adobe Bridge) to route the images through all of our judges. We've had great luck with Flickr, and love it as an engagement device. The only gotcha that comes to mind is that it's not terribly easy to get large numbers of photos out of the system (such as downloading 15,000 images for offline review) so people should factor that into their workflow. I'm doing a panel at NTC with Susan Tenby and will be talking about Flickr and (and Twitter). I'm working on article too. So, I'm hoping that your nonprofit is using Flickr, could you leave me a comment and a URL? I'm hoping to update this list. Another great video from Lee Lefever. Via Jeremiah Owyang .. I found out about Flickr's new stats package. It is only available to pro accounts and it is pretty basic. More here. My total view count is: 675,233 That's because I have a lot of photos - almost 8,000. But some of my photos have made it into places with lots of traffic. It is interesting to me that the photo of Laura Quinn has some many views. 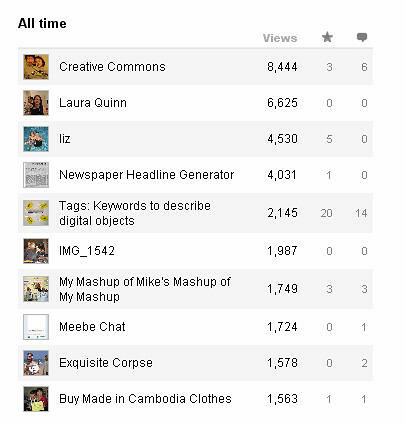 In analyzing the data, it seems like if folks are looking for Laura Quinn of Idealware and google "Laura Quinn" my flickr photo comes up in the first few results. A big hat tip goes out to Andrea Vascellari for this great find. I've been looking for ways to easily cross post selected photos from Flickr to Facebook Photo Album. I've tried a couple of applications, but don't like the design because they created yet another photo album. That this application lets you do is: Use a bookmarklet while browsing flickr to add your photo to your photo album in Facebook. What I don't like about this application is that you can send anyone else's photo to your Facebook Album, but there isn't an automated link back to the person's photo in flickr for cc attribution. In fact, you can easily post all rights reserved photos to your Facebook account. I don't like the fact that it doesn't automate the attribution. I would do that manually because I like to give credit back,but I can imagine people just doing it quickly. Visit the application page and go to the external application and follow the instructions. Adding a reminder about donating to the CC Annual Campaign .. still a ways to go. I'm a sucker for black dogs that look like my old dog Sadie. This photo is from the Humane Society's recent "Wendy That's Not Right" campaign. This technique is the "hold a sign meme" where you ask your community to send photos to flickr of you (or your animal) holding a protest sign. The flickr pool of photos is here. This is a great example of multi-channel marketing with integrating social media along with other more "traditional" internet tools like email. I'm assuming the messaging on Facebook is slightly different from that on other networks or via email. The messaging on MySpace is a very different style. How else is the message being distributed and how it is being tweaked for style and language for different channels? I love the Flickr Hold A Sign Meme - but so far haven't found a great application in Facebook that allows for easy cross posting. Has anyone? I wonder if the photos would also get spread on Facebook? Some of the photos are licensed with "all rights reserved" and it would make sense to promote the cc licensing so the photos could easily spread. I wonder how HSUS is cross-promoting or engaging with the dozen or so brand groups like the Wendy's Frosty Group on Facebook. I wonder what the ROI is of incorporating the social media strategies and how they are tracking this campaign. I would love to see campaign map. 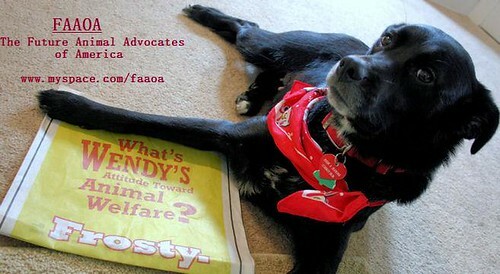 Tell Wendy's to have some compassion for animals! Let them know that we want them to stop using eggs (yes, they use them in their new breakfast menu) from caged hens which are crammed into spaces so small they can't even turn around. Once you've got your picture, you can either upload it directly to the Flickr group above or send it to us at hsusphotos@gmail.com. Please make sure to include your name and where your from on your message. And please only send photos... if you'd like to just send Wendy's a message, you can write to them. Thank you for caring about ALL animals! That's the shareable output from searchCrystal it's an ego search on the term "Beth Kanter." I think this tool would be really useful for me because I am always searching for visual images for screencasts and presentations I have to play with it some more, but I wonder if I hone the search so it only shows me Creative Commons licensed images and adds the attribution. 24 hours of Flickr Day! What happens around the world in one day? In a word – life. Here on Flickr, our members are sharing the world that they see: snapping daily moments, recording history, telling stories, capturing beauty. To celebrate this global community, we invite you to join us in 24 Hours of Flickr, a day-long global photo project. On May 5 2007, grab your camera and whatever else you need, and chronicle your day in pictures. I got asked this question several times during various presentations/panels at I was on at the NTC, including the Flickr Affnity Group session on Wednesday. The question, "How can I display photos in flickr on my web site?" I pointed folks to Splashr after telling the story of how I learned about it during my Beth5.0 Flickr Remix Photo Birthday Card Contest. Alan Levine (cogdog blog) who submitted the winning entry left a comment in a post where I asked that same question. He pointed me to his blog entry about it. There are many flickr tools or rather toys that use the API to extract flickr photos and publish them elsewhere in different ways. The above slide show was created with Splashr, billed simply as “a tool for presenting Flickr photos.” It gives you a bunch of different templates with different styling. What's nice, it generates cut and paste code. If you don't have software programmer at your disposal, this is an easy way to accomplish the task - you don't have to touch code. Of course, you can't precisely display the photos in a customized color scheme, size, or format -- but then again you don't need to know how to code. And, did I mention this little tool was free? There's one limitation, of course, is that slide show is a big size, too big for most blog formats. It would work okay on a web site though, but it isn't embedded. And, to be fair, I didn't test all 30 templates (I'm little tired). There is another way to create an embedded slide show, although it is a little more geeky and (I didn't write up the steps yet - so it may be hard to figure out if you're not a code geek type.) You can use the flickr slide show option as shown here (Thanks Elliot) That reminded me that I did a screencast on how to do a flickr slide show! So, you'd just loose the step of translating powerpoint slides into jpegs and not include the user name in the code line. I know that sounds like greek. N-TEN Conference 2007 - Flickr Session! N-TEN Conference 2007 - Flick Session! How do deal with the lack of control? Giving up branding, not have the photos on our web site ..
What happens if a photograph that we don't like is put in our flickr group? How can we moderate or filter photos? Fear of being sued - what if we stream photos with a tag and it publishes a photo that is all rights reserved in flickr? How do we measure the results? If want people to resue our photos, how do we measure? What is the conversion rate from sharing photos in flickr to donations or advocacy? What type of activity or strategy can I set on flickr that isn't going to require to much of my time to maintain? 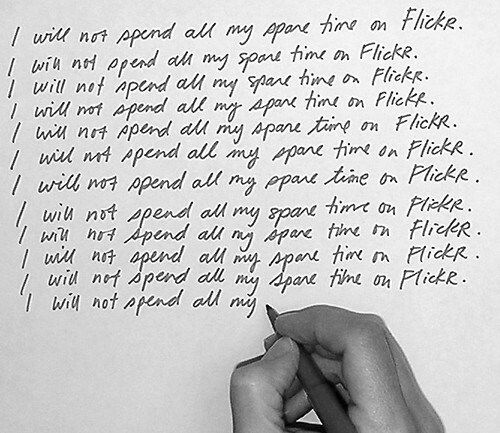 The amount of time it takes to search and participate in the community on flickr - is it worth it? There was one person in my small group was interested in getting started in flickr, he is the IT person in a small organization. He said his major challenge now is to design something that doesn't a huge amount of time to maintain. So, I'm thinking of what the first small steps to using flickr looks like for a nonprofit. Yeha! Flickr Has Implemented Collections! I've been waiting for this one! Flickr has just added a feature called "collections." It lets you aggregate your photo sets! It is very easy to use. I put a collection together of all my photos from and about Leng Sopharath. My collection is here. The official flickr blog post is here. It is great to see flickr innovating. A while back Flickr received some pretty heated criticism for their upcoming deadline on Thursday requiring all Flickr users to convert their "old skool" Flickr email log on to a new Yahoo ID. Some users complained that Flickr was taking away something cool without giving anything in return. It seems timely that Flickr would launch this new feature two days before the above mentioned deadline takes effect. The Flickr for Nonprofits Affinity group will meet in Washington, DC on April 4 at 1:00 PM (check agenda) to share experiences, tips, and ideas about how Flickr can be used to support nonprofits and their programs. It's great that NTEN let's anyone who is passionate about a topic set up an affinity group. Given my interest in flickr that's why I set one up last fall. I'm excited that a few of us can meet face-to-face! How to do you explain flickr to those who haven't heard of it? Flickr is a web-based digital photo sharing application that uses tags to facilitate finding people and photos. It isnât simply about putting your photos up on the web for the world to see. What if you could invite other people from the around the world to have discussions about those images? What if you and your colleagues could annotiate these photos with your own descrptions and observations? What if you could become part of an online community that contributes images of similar topics for you to consume? And, what if you could subscribe to an RSS feed so anytime a new picture was added about a topic you care about, were studying, or writing about - it would come automatically to you? 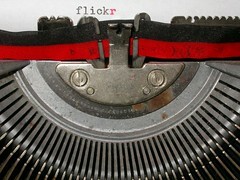 CogDog Blog's Brilliant: What can you do with flickr? Do you think the photos in flickr are crap? Ha! Does your nonprofit have an example of using flickr and you're not listed here? Leave a comment with a url! It has been a long day of pondering inbetween rapid attention shifting tasks, dipping into email, pinging IMs, and browsing feeds. My brain is tired. After a cardio and yoga workout at the gym, spent a good part of the day obsessing about the design for an evaluation on mobile technology tools for health care outreach workers. Next a final look at the final KM4DEV call for papers for June, 2007 Issue called "Stewarding Technologies for Collaboration, Community Building & Knowledge Sharing in Development" (I'm a guest editor along with Nancy White, Beverly Traynor, and Lucie Lamoureux - others to join.) Then onto pondering for a project to collect leads for professional nonprofit conferences and trying to figure out what will be easier for respondents - email reply or wiki. Wiki seems to be a theme for me today, starting off with an email from colleague asking me and several others about the best method to collect quick feedback for a draft of a survey. Funny several other colleagues cc: in the email said wiki! I agree in theory, but in practice I have to say it depends. Who is the audience? How large is the group? It depends on how "finished" the survey is, how long it is, and whether or people you want to solicit feedback from are in a wiki habit. Would you miss out on valuable feedback from some folks who are, as one colleague said to me, "I'm allergic to wikis." Is a wiki really the best method for on-shot feedback or is it better for deeper collaboration over time? I think providing multiple methods -- like email, blog comments, is good thing -- unless it is a very small group of collaborators. The interesting thing I discovered was that you can easily track your blogged flickr photos through the flickr inspector's integrated search. So, here's another set of ego feeds you can add to your reader. Why bother? Good question. Not sure except that you could see if your photos were not being attributed, connect with a kindred visual spirit, find an amusing way to take a mental break. How Best to Stream Tagged Flickr Photos on a Blog or Web Page? 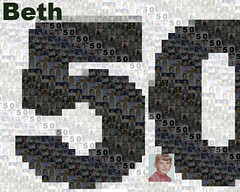 The Beth5.0 Flickr Photo Remix Cards are all wonderful so I'm going to start blogging them!! I love the creativity and I'm learning a lot about remix tools. Today, the group membership reached 50 people, with 11 cards so far (not counting the ones I made). Keep 'em coming - there is still time to participate. Here's the information. I am wondering how to display them all. I'm thinking of doing a slide share show. The other option might be to see I can stream all the photos in the group and have them display in a post. Maybe one of the flickr widget badgets? Searching through flickr to find photos that are interesting and by creative commons using the flickr search is sort of a pain. Here's two tools that play with the flick API that let you add annotations. The one mentioned by Stephen Downes has an online image editor. Cogdogblog walks you through using it. Search for and edit photos on flickr that use creative commons licensing.